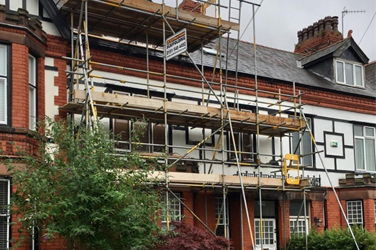 Whether you're building a house, converting farm buildings, or adding an extension, C and E Structures can provide the right kind of domestic scaffolding for your project. Order your outside broadcast scaffolding from C and E Structures and enjoy the benefits of a professional outside broadcast scaffolding service from experienced, qualified riggers. Construction Scaffolding for Domestic and Commercial Use. Construction scaffolding provides a safe, protected environment for working at height whatever your project. 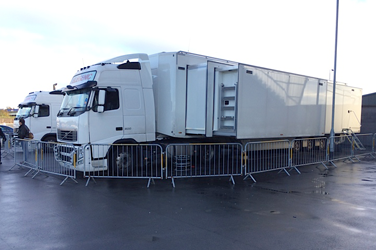 As part of C and E Structures scaffolding and rigging services for outside broadcasts and sporting events, we supply and fit Heras temporary fencing where you need it. 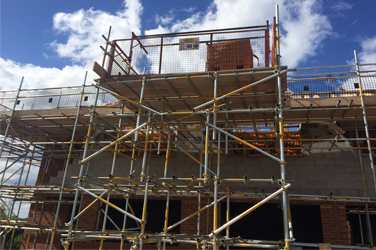 C&E Structures have worked for Elan Homes and myself for over 18months , they have proved to be a reliable and professional scaffolding contractor who perform exactly to the build programme and work with my Site Managers and Contract Managers effectively . The standard of scaffold is extemporary which not only impressed myself but the regional Health and safety manager from joining our sub-contractor base to current day. Ian Evans is a very approachable individual who has a high standard of expectation and has a very organised business acumen . The consequence of this company and Ian’s control and performance has resulted in C&E tripling there workload with élan and I’m sure will continue to be part of this growing business in the future years. Delivering the spectacular "Amazing Graces" projection show as part of Cunard's 175th year celebrations was an vast logistical and technical feat. With a coastal location and regular high winds the stability of projection towers to hold the array of projectors was paramount. Any movement would have led to a reduced three-dimensional illusion during the show which was seen by around 60,000 people over three nights. We were hugely impressed by the design process of C & E Structures in devising a system that would fulfil the height and weight loading requirements for the projection as well as being safe enough withstand high winds and dynamic environment. From initial technical design to onsite delivery, C & E Structures were the professional choice for a project that needed perfection and I couldn't recommend them enough. They will certainly be our first choice when working in the region again. "C & E Structures have been the sole suppliers of scaffolding to Sky Sports coverage of Rugby League for some considerable time. 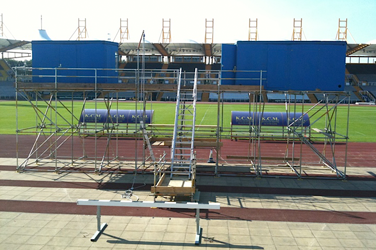 They have supplied commentary platforms, camera gantries and special structures in the UK and Europe. Their dedication and attention to detail are admirable and I am happy to recommend them to any prospective client. We used C & E Structures while on location in Liverpool for 6 Weeks shooting Blood. Ged and his team became an asset to our crew. Every obstacle they overcame with ease and even the most difficult of rigs which there were many, they always had a solution to achieve our lighting. Objectives: All the team were professional, motivated, worked with a smile on their faces and good fun. Would highly recommend to any Gaffer/Production visiting Liverpool/Manchester." "We've used C&E Structures Ltd since January 2013. I can confidently recommend C&E Structures Ltd as a solid & reliable supplier, and experts in their field"
"I have used C&E Structures on my last two Feature Films ("BLOOD' and then 'NOBLE') Our Production team and shooting crew found them to be efficient, reliable, economic and great to deal with. They were always helpful in finding solutions to difficult rigging problems. Our Production considered them to be an important and essential part of our crew." "Just a few words to say thank you for all your efforts over the last 3 years on our flag ship development ,Weaver Park ,Hartford ,Redrow we delivered 263 units over 4 phases on time and within budget , and most importantly safe free , not a single accident reported with a scaffolder, which was a great achievement, the standard of work was excellent and first class supervision, I wish you every success on your new development in Liverpool for Redrow." © Copyright 2019 - C and E Structures - All rights reserved.